Hi. My name is Milton. I live in Argentina, where I work as a sound technician in my own recording studio. This is a project I've been working on for over two years, and now I feel it can be finished, so I decided to make it public. This is my own remake of Metroid 2, one of the most important chapters of the Metroid saga. 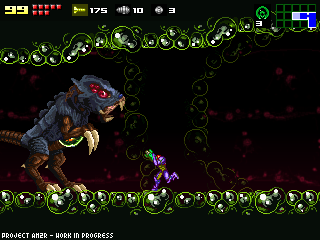 I always wanted to play the game with the graphics and physics of Metroid Zero Mission. So, I decided my next game would be a remake. During the next weeks, I'll share with you the progress so far. I'll post screens from the very beginning of the project, until its present state. I also documented some of the most important aspects of the game design. <- This, for exampe, is one of the early test builds. I am using Game Maker 6, and used Martin Piecyk's Platform Game template as a starting point. His excellent engine provided solid platform physics, and state based characters. 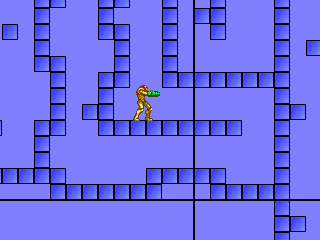 The engine is also easily customizable, so I could add all the states I needed for Samus. So, stay tuned for the next update, I'll show you some more screens and reveal some gameplay details. ckeck your gmail i have something i can do. Wow... You've come such a long way; and in just over 18 days, it'll be released! Congratulations doc, here on your last stretch of your project... Just wanted to say thank you for all your time and effort, kudos to you! Man I can't believe you've been working on this for so long. Kudos, congratulations and well done Doc. Thank you so much for your hard work on this series that I love so much, maybe one day Nintendo could learn how to treat Samus the way she deserves like you do. The blog post that started it all, and now it's finished but gone. Best of luck for you in the future Doc.